Ice Bank Cooling System: 40 years of know-how at your service. The ice water system of the RM/IB cooling tank features a built-in ice bank, ensuring intensive milk cooling without any risk of freezing. The ice bank system sprays ice water across the external surface of the inner tank. This accelerates cooling by 50 % compared to a standard direct expansion system. Thanks to Packo’s high-quality Ice Bank technology (IB), the cooling time is reduced by half, with no risk of freezing the milk. Cooling with ice water is particularly effective when used with AMS milking. Being the world leader in ice bank systems, Packo has been developing and improving this technology for over 40 years. 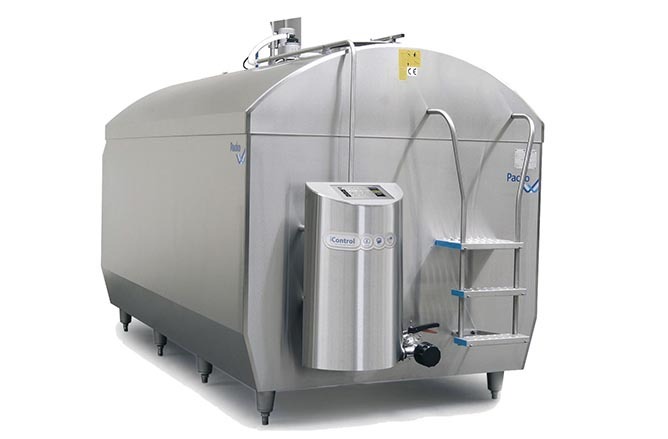 This system, which was previously considered as a simple variation on the “bain-marie” system, is, nowadays, increasingly applied in the world’s leading dairy industries. Its strength goes beyond just maintaining milk quality. The ice bank milk cooling tank will store a reserve of ice, which means that the cooling units don’t need to be switched on during milking. There is less risk of milk temperature increase due to this ice reserve, even in the event of power fluctuations. The other advantage is that you don’t need to invest in large cooling units, which saves you space and cuts down installation costs. Another added bonus is the fact that you can avail of cheaper night-rate electricity to build up your reserve of ice, thereby reducing running costs substantially.